Eighteen beryllium primary mirror segments are packed up and ready to ship to NASA for the James Webb Space Telescope. BOULDER, Colo. — One of the most challenging parts of NASA’s huge new space telescope, the building of its ultrasophisticated mirror system, is now finished, and the mirrors are ready for delivery. Send-off ceremonies held here at Ball Aerospace on Aug. 15 saluted the completion of 18 beryllium primary mirror segments for the James Webb Space Telescope (JWST), which is billed as the successor to NASA's venerable Hubble Space Telescope. Ball is also responsible for JWST’s secondary and tertiary mirrors, a fine steering mirror assembly and several engineering development units. Ball is the principal subcontractor to manufacturer Northrop Grumman for the JWST optical technology and lightweight mirror system at the heart of the telescope — an astronomical project that is now pegged to cost roughly $8.7 billion and to be lofted in the fall of 2018. Down on the floor where the packaged mirrors are ready for shipping to NASA, labels such as "do not stack…this side up" and "critical space flight hardware" are visible. A folding scheme allows the primary mirror segments to fit atop Europe’s Ariane 5 launcher for their eventual unfolding in space. Aligning the mirror segments and adjusting the primary mirror’s curvature will occur over approximately two months. It has taken about eight years to complete the fabrication of the mirrors, said Paul Lightsey, a Ball mission systems engineer for the optical system on JWST. "We actually have a real nice success story," Lightsey told SPACE.com. "We’ve been able to show how long it took to polish the first mirror, then each successive mirror. By the time we got up to the later mirrors, we were taking half the time than it took for the first mirror." Working together as one mirror, those 18 beryllium mirror segments are adjusted by computer-controlled actuators. They adjust each of the mirror segments to correct any errors and are key to giving JWST the power to produce high-quality, sharp images. "One of the difficulties in making mirrors is to make the curvature exactly what you want," Lightsey said. JWST's mirrors can be pushed and pulled a little to get the curvature right, as well as moved up, down and sideways, he said. 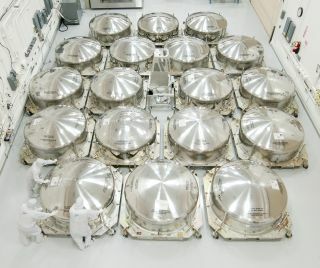 Allison Barto, JWST program manager at Ball Aerospace, said the beryllium mirrors couldn’t be too heavy. "We had to take out over 90 percent of the material in the back of the mirrors to make them light enough to launch 18 of them into space," she said. Since JWST is an infrared telescope, the mirrors and actuators must function at temperatures as low as minus 400 degrees Fahrenheit (minus 240 degrees Celsius). Lightsey said the JWST project is set to be a five-year mission, but has a goal of 10 years beyond commissioning. Outfitted with a five-layer sunshield, JWST will operate at supercold temperatures at a spot about 930,000 miles (1.5 million kilometers) from Earth known as Lagrange Point 2, or L2. At L2, the balance of gravitational pull means that the telescope will keep up with the Earth as it goes around the sun. The gravitational forces of the sun and the Earth can nearly hold a spacecraft at this point, so that it takes relatively little rocket thrust to keep the spacecraft in orbit around L2. But JWST’s astronomical to-do list now includes eyeing alien planets, too.. The instrument will also investigate the properties of planetary systems and, perhaps, the origins of life. "That wasn’t part of the original plan … but this instrument can look at planets orbiting other suns," said Blake Bullock in JWST business development at Northrop Grumman, the prime contractor for the huge spacecraft. The telescope has the ability to look for biomarkers, such as water in the atmosphere of a planet orbiting another sun, she said. "It’s not going to give you the pale blue dot … but it could give you a squiggly line that says there might be carbon … there might be an ocean," Bullock said. Geoff Yoder, NASA’s JWST program manager, told SPACE.com that the telescope is on track for an October 2018 liftoff. Still to come, however, are key integration tests of the fully assembled and instrumented observatory. Yoder said work has been completed this month on an Apollo-era test chamber at NASA's Johnson Space Center in Houston, modified to test the integrated JWST at cryogenic temperatures — at minus 424 degrees Fahrenheit (minus 253 Celsius) or colder. Matt Mountain, director of the Space Telescope Science Institute in Baltimore, noted the size of JWST. "Hubble is the size of a school bus," Mountain said. "JWST is the size of a tennis court." JWST’s mirrors are so flat that if you stretch them all out across the United States, "the largest bump would be no bigger than two inches. That’s how smooth these mirrors are," Mountain added. NASA's chief scientist, Waleed Abdalati, underscored JWST’s future abilities. "The things that are blurring to Hubble will be in sharp focus. And the things that Hubble doesn’t know are out there will be observable, back to the beginning of time as we understand it."